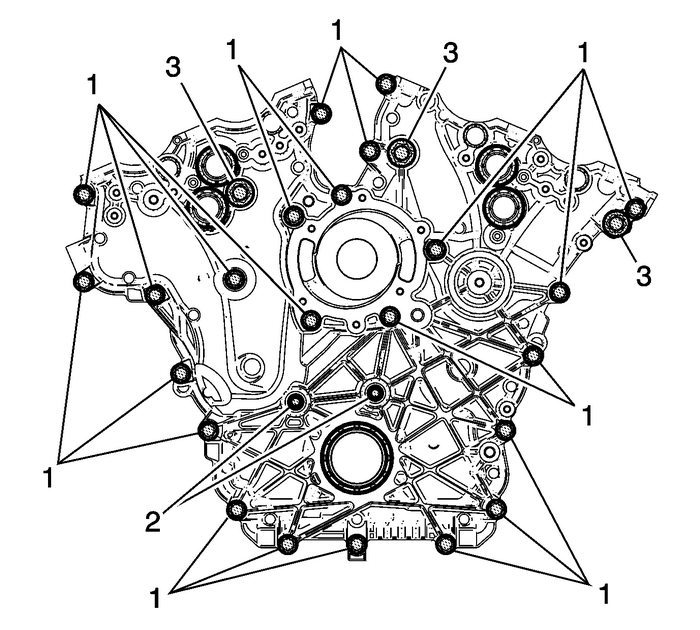 Remove the camshaft position sensorbolts-(1).Remove the camshaft position sensors-(2). 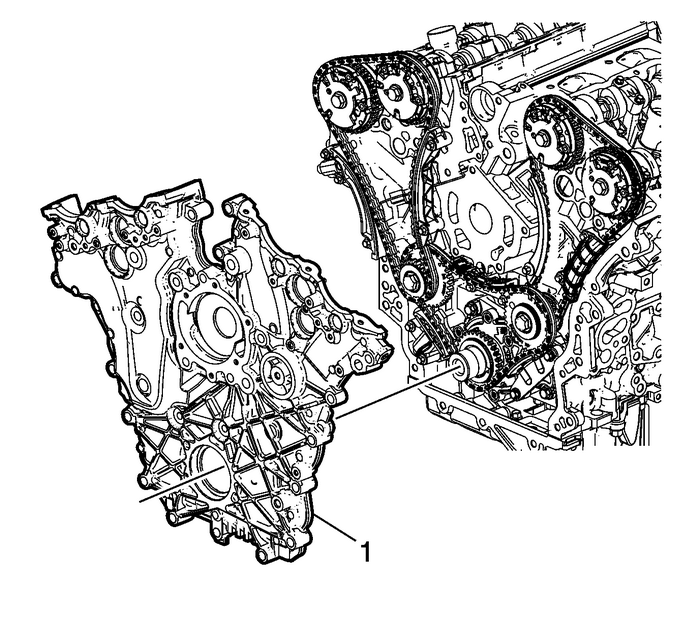 Remove the camshaft position actuator valvebolts-(1). Caution:The camshaft position actuator valves must be removed fromthe front cover prior to front cover removal or damage to thevalves may occur. Remove the camshaft position actuator valves-(2)from the front cover. 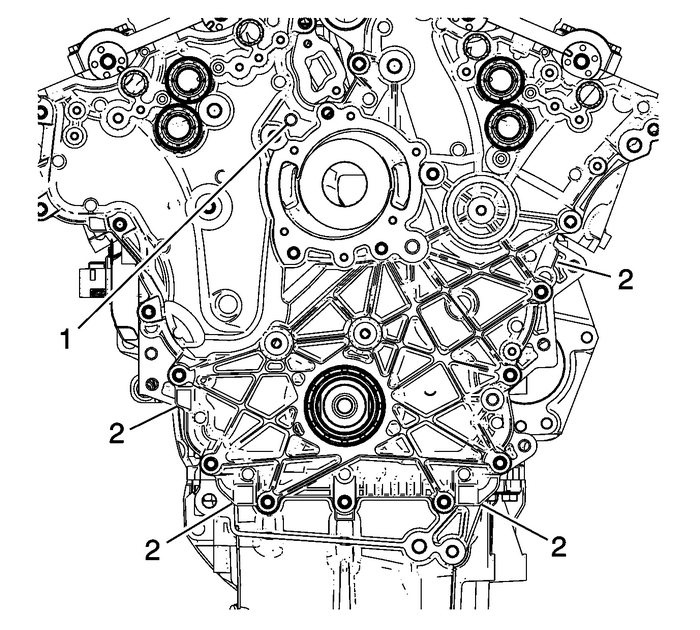 Note:Engine front cover bolts in the number-(3)location are model dependent and may have already beenremoved. Note:There are a total of 23-M8 bolts-(1)and 2-M6 bolts-(2) that must be removed, and3-optional M12 bolts-(3) that may need to beremoved before the front cover will separate from the engineblock. 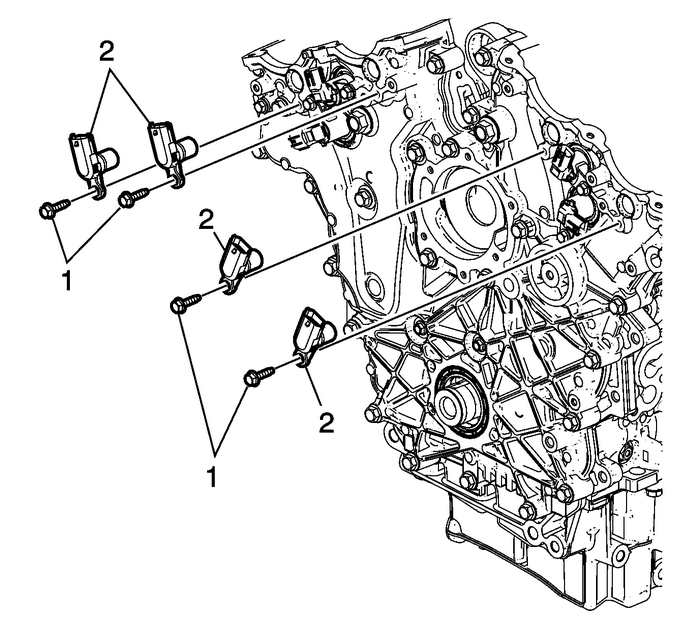 Remove the engine front coverbolts-(1–3). Caution:Do not use the jackscrew hole without first removing allengine front cover bolts. Failure to remove all engine front coverbolts before using the jackscrew hole could result in damage tocomponents. Caution:Do not pry between the engine front cover and the camshaftposition sensors or the camshaft position actuators in order toseparate the RTV. Use the pry points and a bolt in the jackscrewhole in order to remove the engine front cover. 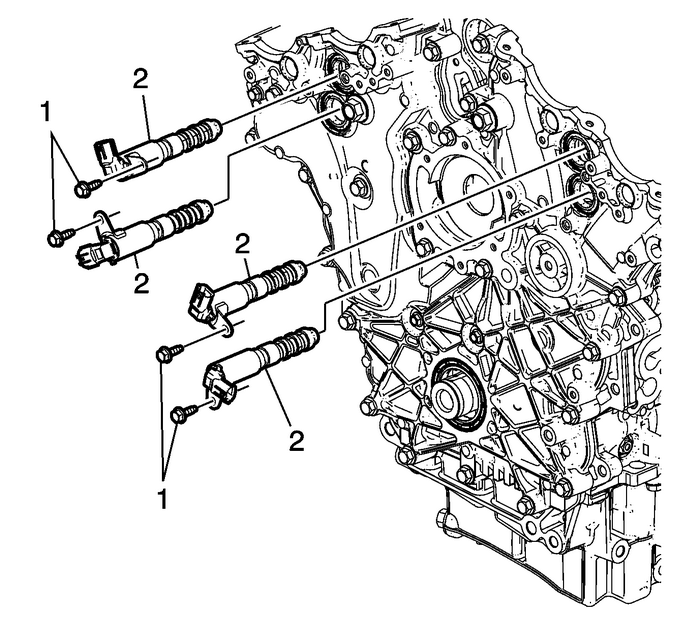 Damage to thecamshaft position sensors or the camshaft position actuators mayoccur if the camshaft position sensors or the camshaft positionactuators are used to pry against in order to remove the enginefront cover. Loosely install a 10 x 1.5-mm bolt in thejackscrew hole-(1).Using the pry points-(2) located at the edge ofthe front cover and the jackscrew, separate the room temperaturevulcanizing-(RTV) sealant. Remove the engine front cover-(1).